I wanted to share some artwork with you. It’s “Lye” by Jean-Michel Basquiat. I’m watching a documentary about him on NetFlix (Jean-Michel Basquiat: The Radiant Child) and this artwork popped up on the screen. All I saw was the word “lye” but that was enough to pique my interest. Sure enough, he is talking about processed hair. What does the image stir up in you? I am working on a blog post that describes a deep, emotional experience I had on my family RV trip. It’s about our visit to Sullivan’s Island in South Carolina. However, in order to do the experience justice, I need to do some historical research and it’s taking me awhile to get the facts straight. Stay tuned for what I hope will be an interesting and informative post. In the meantime, I wanted to share some artwork with you. 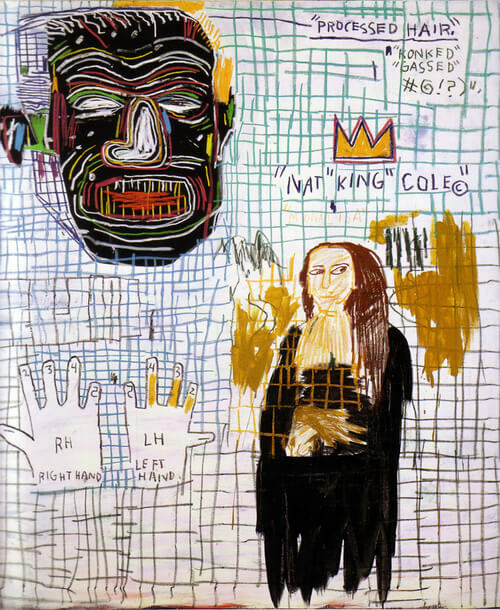 It’s “Lye” by Jean-Michel Basquiat. I’m watching a documentary about him on NetFlix (Jean-Michel Basquiat: The Radiant Child) and this artwork popped up on the screen. All I saw was the word “lye” but that was enough to pique my interest. Sure enough, he is talking about processed hair. What does the image stir up in you?